My name's Jan and this is my website all about Villamartin in Spain. Register now for free to talk about Introduce yourselves in Villamartin and much more! Hello,I want to move to villamartin possibly september, from scotland. Hi hope to be in Villamartin or surrounding area in sept. my house is up for sale at the moment. I was wanting to get feedback from anyone who is living there from the UK and find out all the pros and cons. Big step but hopefully a nicer life awaits my husband and I.
I guess it depends on your point of view about what constitutes a ‘pro’ and a ‘con’. There’s a large percentage of non-Spanish people who own property in the area. Lots of Brits, but also many Germans, Scandanavians etc. English is the common language used to communicate between the various nationalities and to communicate with the Spanish. This means that you can walk in to almost any shop, restaurant, business etc in the area and get away without being able to speak a word of Spanish (assuming you can tone-down the Scottish accent sufficiently to make yourself understand to non-English people). So, the bars are full of Brits or English speakers, sometimes behaving like typical ‘Brits Abroad’ but more usually being polite and considerate - if a little intolerant/ignorant of the local customs and culture. It’s busy during summer, especially in and around Villamartin Plaza and the local beaches and the ‘yob factor’ increases proportionally during the peak season. Great if you want a rowdy night out with the lads and ladettes, but sometimes a bit much I’d you’re looking for something a bit tamer. There are other places to eat and drink during the busiest periods, so in reality you have the best of both worlds - hustle and bustle if you want it or somewhat quieter places to eat and drink if not. Traffic in the area increases during summer, but you can usually take to the back roads, or the AP7 toll road, if you want to avoid the worst of it. During the winter months some of the bars and restaurants do close down, but it’s far from being a ghost town. Property prices are still extremely cheap, although the exchange rate isn’t as good as it was and tends to fluctuate a bit asked on the latest Brexit news, but overall I think the area still delivers a lot for your money. The weather is good - maybe a bit too hot for fair-skinned Scots in July and August, but that’s what Aircon is for. Although the weather is still very mild in winter compared to the northern UK, Spanish houses are generally built to stay cool in summer, so feel very cold in winter. Very few have central heating as standard, so you may need to do some work in that area to make it cozy. There’s is good access to things like fast internet and more places are getting mains gas. Most properties connect to mains sewers, so it’s all very civilised - which may not be the case of you go to a more rural area. Public transport does exist, but personally I think you need a car to get around properly. The roads are generally very good (although the speed bumps around Villamartin can be a bit punishing on the suspension). All in all, we like the area very much. For us it’s a holiday destination where we spend around 30% of the year, so we have the option to avoid the coldest months if we wish. 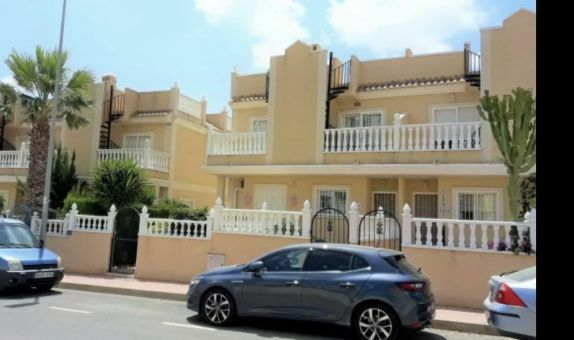 I don't live in Villamartin but have visited numerous times and depending on what you are looking for in your 'new life' it is as good a place to live as most places in Spain. I've lived and worked in Spain for nearly 30 years, in 3 different Provinces, all very different and during my time in Spain I've made many friends with all nationalities, however obviously there are more Spanish than others and I've found it took a long time to understand their culture and to be accepted, but it was really worth the effort ! So my advice would be ..Don't rush in to anything..take your time and choose a house and place that suits you personally, everyone will tell you that where they live is wonderful and it probably is ..for them, but only you will really know what you need..so no hurry...research...research...research and visit as many places as you can , at different times of the year and even different times of the day !! May I wish you every success in finding the perfect end of your rainbow..
Hi Les, from what I understand, it's not quite as clear-cut as is being reported in the local press. I don't think the tolls can easily be abolished until the current concession ends, which I believe is December next year (2019) and then it would need the central rather than the regional government to approve (and in-effect fund) that move. There may also be short stretches, including the bit near La Zenia, where the concession lasts much longer. Of course if the new central government wanted to totally turn the tables it could scrap the tolls tomorrow, by tearing-up the concession agreements altogether. Although this would be nice for us, it probably isn't going to happen as the amount of compensation it would need to pay would be horrific. As with everything in Spain, I'll believe it when I see it. In the meantime I'll keep everything crossed in the hope that it does happen. I strongly recommend that you rent rather than buy for at least three years. This is the period for which you can contract security of tenure under Spanish law. Don't get fobbed off with an 11 month deal.Great for agents commission but nothing in it for you.You should know that Spanish property has fallen 40-50% from the highs of 2002-2006. The transfer costs are not slightly higher than England but drastically higher at about 13%. When you come to sell, you'll pay 6% commission to the selling agent as well. With market conditions as they are - only the estate agents will tell you the market is booming - you'll be waiting a long time to make 19% and recover you investment. Also in England the tenant pays the very high poll tax and community fee whilst here the landlord pays them. You only pay extra for light and water (and internet if you install it). The rubbish (basura) is a matter for negotiation. Hope that helps. "A Place in The Sun"? My wife and I watch it and laugh! It is sad how many fall for the dreamlike claims. Often it is the most grotty properties that are offered and the reactions of the prospective buyers make us think they have been brainwashed in advance. Anyone trapped with the ownership of some of these properties might have a 20 year wait to sell and the programme offers that straw for the dying man! I personally know of at least three local homes that have been on the market over ten years. Once every five years the agent goes and renews the faded and pealing signs! Another point - warn your friends - Spanish mortgages are not too difficult to get BUT if you default you will be bankrupt for life - no you can't hand in the keys (like England). There has been news that in a few cases the banks legally chase their defaulting mortgagees back to the English courts. Yes I admit this is rare but it's possible. You are liable right down to the shirt on your back and the shoes you walk in!! PLEASE be careful. I have lived here 33 years and Spain is still a lovely place to live - but please don't leave sensible caution at home. DON'T pay out any money until you are totally sure you are protected. English regulation and cameras have a longer range than in Spain. If it goes wrong it's hard to get redress. Well summed up a person with there brain in the right place.I often feel all new arrival get a spot on there for heads to help estate agents identify them.